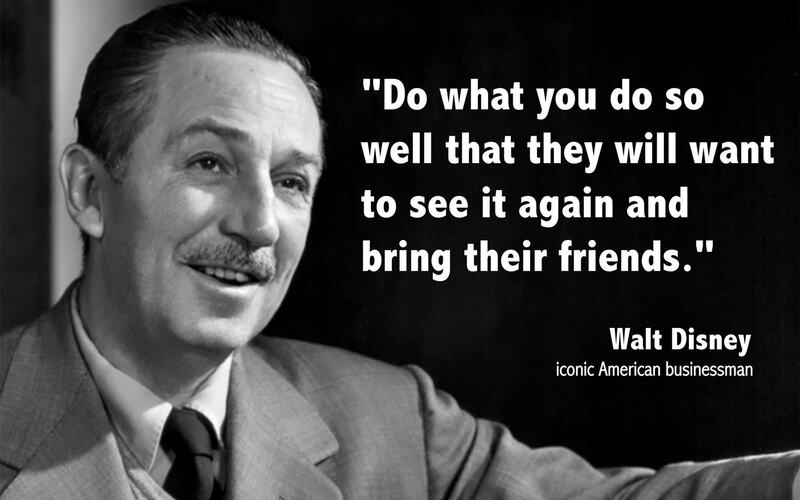 Walt Disney was the originator of the practices that came to be called Guestology. The Disney organization remains the world’s foremost practitioner of the Art & Science of serving their Guests. Because of that, I’m starting Summer Term II of the 2013 GsD program with Applied Guestology 201, a quick review of some of the leading organizations who deliver exemplary Guest Experiences with application to ChurchWorld. We begin with Walt Disney and move from there to several well-known organizations, wrapping this course up by returning back to the Magic Kingdom. In order to understand the magic of Disney’s Guestology, you need to know a little about Walt Disney, and why he cared so much about customer service. When he threw his energies into the creation of Disneyland in the early 1950s, he was totally concentrated on the guest experience. The very idea for Disneyland was born in Saturday trips to amusement parks that Walt Disney made with his two daughters. In those days, amusement parks were disreputable, dirty, and often in poor condition. While watching and waiting on his daughters to finish their rides, he began to watch the other customers and how they reacted to the parks. A single question drove Disney: How could this experience be improved for the entire family? With a little bit of the same magic, your organization can do the same. “Be Our Guest” has been the invitation to Disney visitors long before the song from Beauty and the Beast became a box office hit. It underscores an important element in the Disney vocabulary, that customers are not referred to as such, but rather as Guests. In the Disney nomenclature, the word “Guest” is capitalized and treated as a formal noun. This principle has to be the starting point, the foundation on which all else is built. Everything – and I mean everything – is done with the Guest in mind. At Walt Disney World, exceeding Guest expectations is the standard call to duty for all cast members, both those “onstage” and “backstage”. Quality Service means exceeding your Guests’ expectations by paying attention to every detail of the delivery of your products and services. That’s it. The magic of Disney’s customer service is paying attention to details. But as you might expect, the simplicity of those few words is lived out daily by tens of thousands of Cast Members performing and interacting with hundreds of thousands of Guests, all delivered with a magical smile. Exceeding Guests’ expectations is Disney’s service strategy, and paying attention to every detail is the tactic by which it is accomplished. That’s how Disney does customer service. A common purpose generates quality standards. The standards are defined and delivered using three basic systems that every organization shares: its people, its physical assets, and its processes. All three are integrated and aligned to produce the Disney brand of magic. At Walt Disney World, they expect Guests – and plan to exceed their Guests’ expectations every time. What about you? When it comes to ChurchWorld, more often than not we have visitors. It may be a little thing to you, just a word, but I think it’s actually a powerful first impression that needs to change. The first step in creating a WOW! Guest experience is to remove the word visitor from your vocabulary, never to be used again. It’s a little thing to be sure. But it’s a mindset change that will really impact how you create the rest of the experience at your church. You are expecting Guests this weekend. Guests come to your place, looking for a warm greeting, a smiling face, and an experience designed to make them feel like, well, Guests. Nothing phony, manipulative, or in-your-face; just welcome them as guests with the most sincere, energizing, and loving experiences you can. Start with this simple change that conveys a powerful image, one that will be reflected through your church – and you have taken a HUGE step in understanding what Guestology is all about. This entry was posted in Disney, Guest Experience and tagged Applied Guestology 201, Be Our Guest, Disney U, Doug Lipp, GsD Summer 2013, Guestology, J. Jeff Kober, The Disney Institute, The Wonderful World of Customer Service at Disney. Bookmark the permalink. Bob. I’m writing a book on Vacation Rental Management Professionals. I’d love to quote some of this article. Do you mind sir?